Eric was and always will be special. 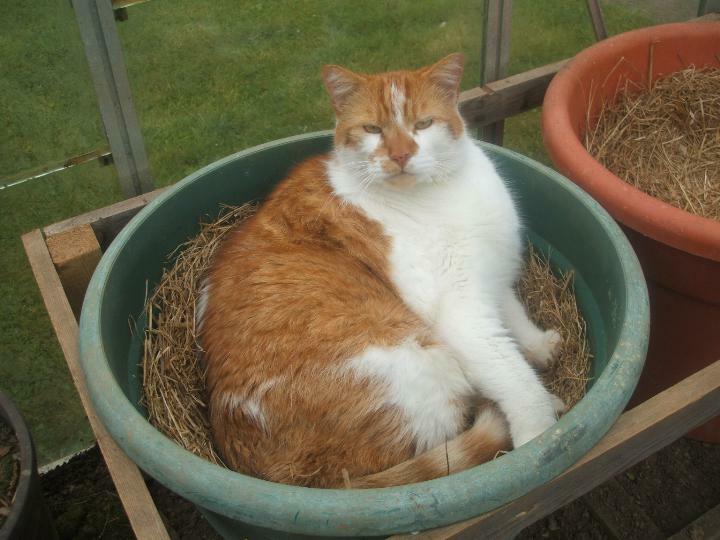 Ivor first met him when he was just a few days old and chose him as the kitten he wanted. I went to the farm where he was born a few days later and chose his litter mate Flynn. 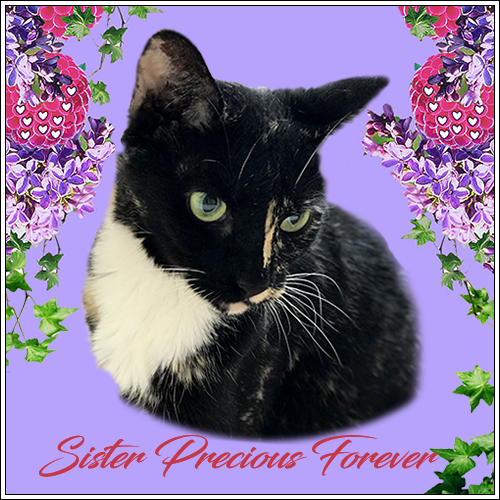 They came home with us when they were 5 1/2 weeks old to keep Kit company who was grieving for the last of her brothers and sisters who had gone to the Rainbow Bridge. They have never spent a day apart in almost 13 years. Eric with brother Flynn aged 6 weeks. Although Eric and Flynn were litter mates they had very different temperaments. Whereas Flynn runs everywhere and wants to do everything yesterday, tomorrow was always too soon for Eric. 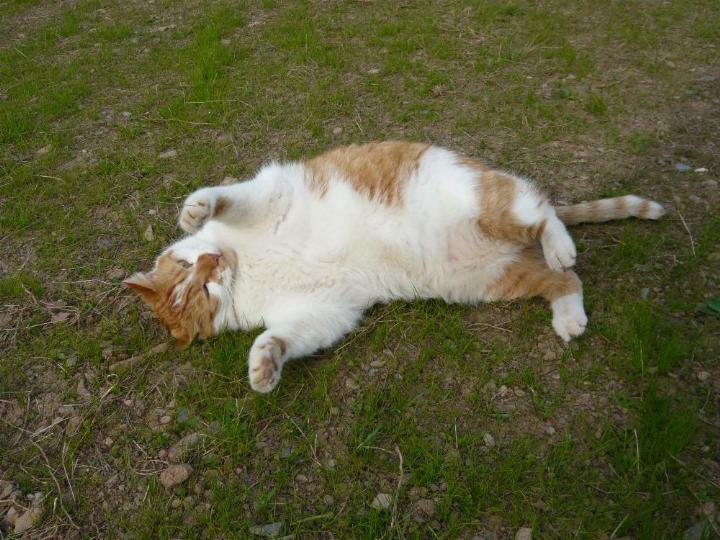 He was always very laid back and we would call him our big handsome lion. He loved to walk the fields with us and Flynn, and if he could paddle in the stream while we were out, then so much the better. I should say now that it was Eric's love of his walks and water that was how we started to blog in the first place. Back in 2006 we were out on a cold icy morning. I called the boys to go back home but Eric decided he wasn't ready and no amount of calling would change his mind. 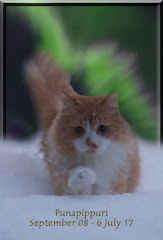 I started to climb down the bank to get him and slipped on the ice and broke my leg badly. 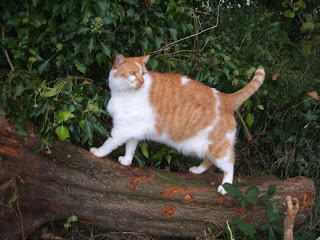 I was laid up for quite some time and was getting bored so I googled "ginger cats" and found Fat Eric. 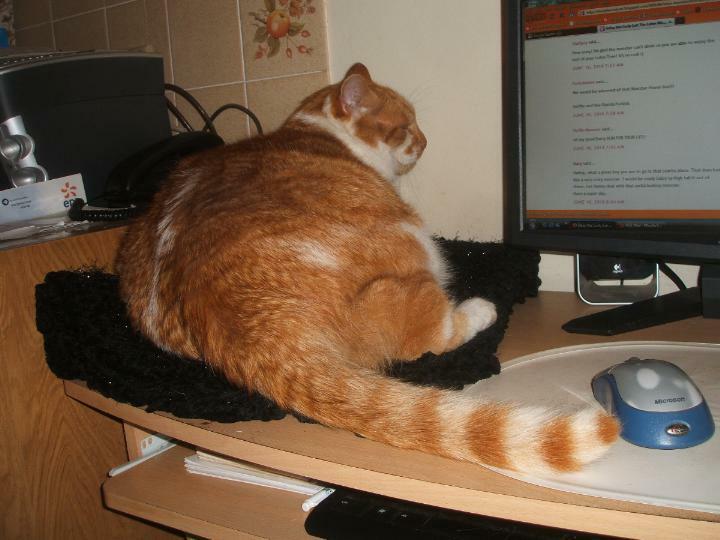 His mum persuaded us to start a blog and in July that year Eric and Flynn joined the cat blogging community. He soon decided the desk was a good place to sit and help me blog. although he often got easily distracted. 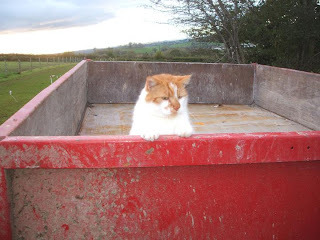 When he was out and about he considered it his Mancat duty to check out the farm machinery in case there had been intruders about. 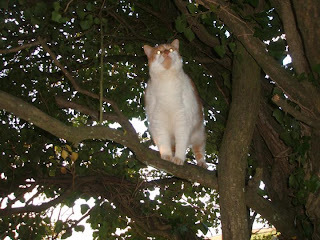 He enjoyed climbing trees with Flynn but was never very good at getting back down and many times I had to help him. Now to get back down. A ladder was much easier. 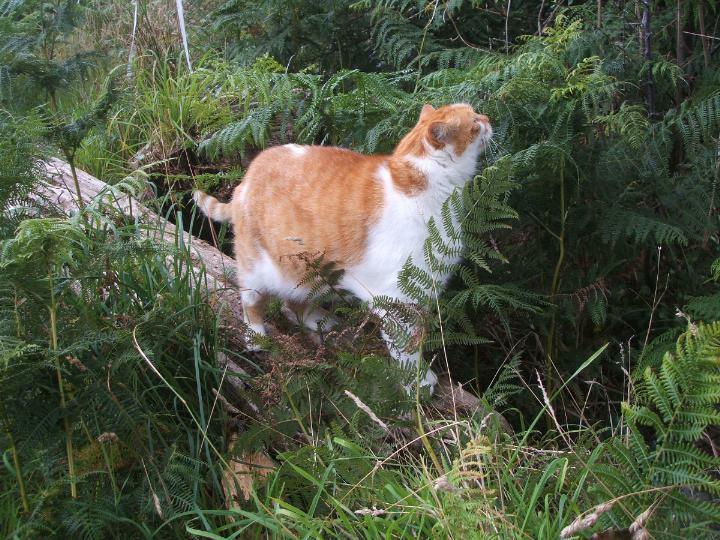 When he was in the fields he loved to explore the hedges and undergrowth. 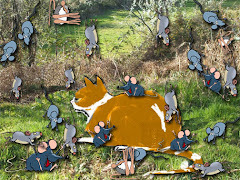 And if he found a mouse, that made it so much more exciting. When he got back from his walks he would often enjoy a bit of gardening. followed by a bit of relaxation in his chair. Or on his shelf in the sun. although sometimes he chose the wrong one. When I was recovering from my operation he made sure that he was there to help nurse me. He was though, and always will be a daddy's boy. Below are more of our favourite photos. More handsome than the flower. A kiss for his brother. 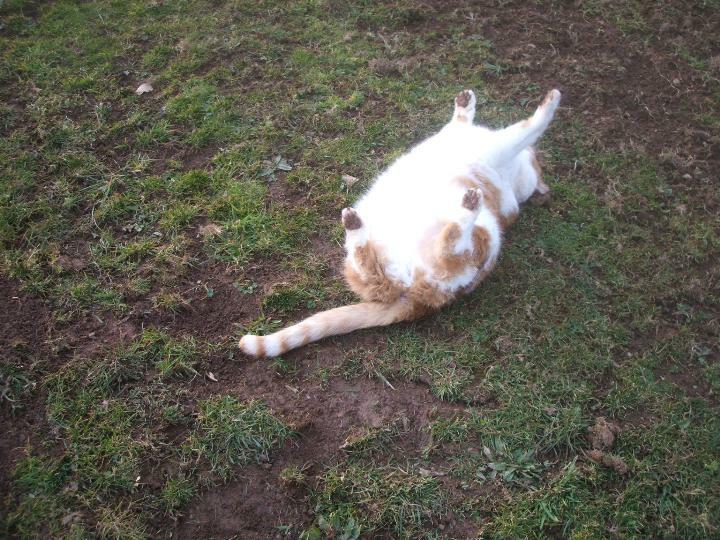 No tribute to Eric would be complete without that beautiful white tummy. We had many lovely tributes for our boy and an unbelievable amount of messages of sympathy and we thank each and every one of you for them. 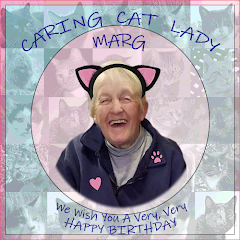 One from Mark, TBT from Mark's Mews really touched my heart. It wasn't just for Eric but for all our beloved cats who have left us for the Bridge. With his permission I have reproduced it below. 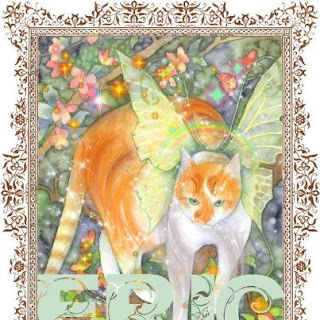 It is followed by the beautiful graphics that were made for Eric. We love and miss you very much Eric but you will always live on in our hearts. 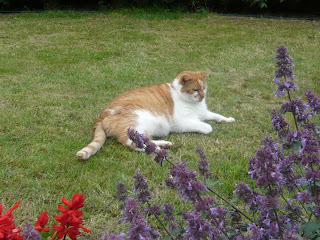 Eric 8th April 2000 - 19th March 2013 RIP. and the losses were few. O'er The Bridge it did seem. And now it seems daily! And I stop this rhyme. 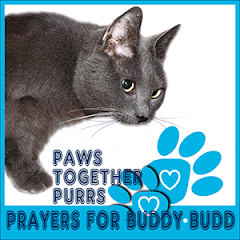 It is becoming so hard to hear of one friend or at least known cat after another passing over the Bridge. I can hardly bear it. I can only leave what seem to me to be such inadequate few words of comfort. I sit and cry each and every time, but my comments seems so lame, saying so much less than I want to say, but not knowing how to say more. 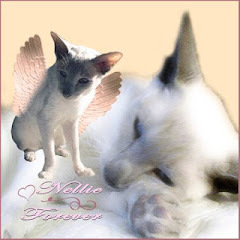 I (and we all) know how much the loss of the dear friends mean to each and every one who has lost them, and I apologize for not being able to create a grand and loving farewell to all the kitties who mean so much to me (and especially their Beings) and deserve better comments from me when they travel to the Bridge. I can't type through the tears. How creative can you be when you just can't see the keyboard anymore? And remembering your own losses while trying to think of good words to those good Beings sufferring a new loss? I'm a guy, and I don't have much experience at this. When I was younger and a friend lost a loved one, it was a tentative "tap on the shoulder and I'm sorry, dude". That was enough between us. But put into words as a comment on a blog, it sounds so lame. 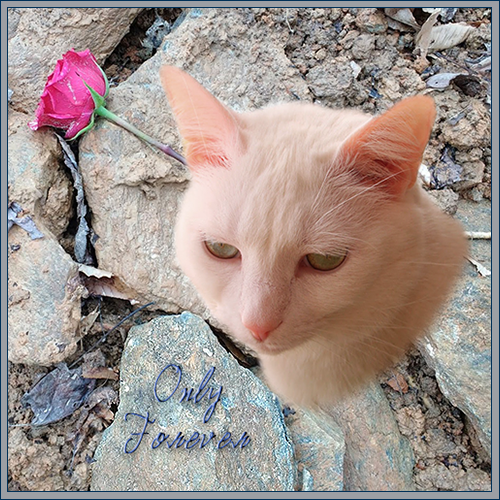 I guess what I'm trying to say is that I wish I could say more specific things to each person who has lost a beloved cat about that ONE cat and the loss you are feeling, but I can't. I keep having to push the keyboard away to save it from the tears that are falling like rain. The tears like rain are what I can offer. You won't see them, but they are there. Constant, unstopping, a tissue-box full. 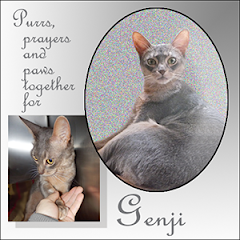 I can't show them over the computer, but they are here, So know that when I mention our "Best Purrs of Comfort", there is a lot more behind the simple words. I am crying with you, for you, of you, to you, and knowing your pain of loss. I know (as most of us but the luckiest do) the pain. Just forgive me if I can't put THAT part in words at the right time as well as I would like to. YOur memorial page for Eric is wonderful. We love all the tributes as well. What a big fella he was, as seen with his Dad. 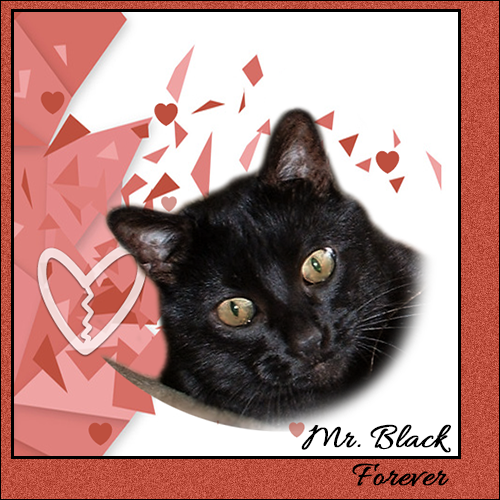 We know you will always keep him in your hearts. We remember him forever. You got Me to tear again. Beautiful memorial your mom has done for you. Me and Mom miss you lots than yourself can imagine. We cried again too. That was such a loving, loving tribute to dear Eric. We so miss that Eric but we feel him in our heart so we know he lives there, and will forever. Hugs and love from all of us. What a beautiful tribute! I'm typing this tearfully because Kitty and I although only knew Eric a short while, loved him too much! We both miss him so much. 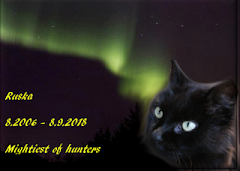 Thank you for sharing your fond memories of a wonderful Mancat! 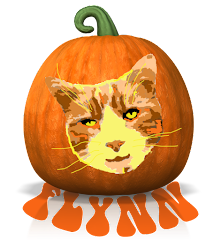 Love to you and your family, especially Flynn! 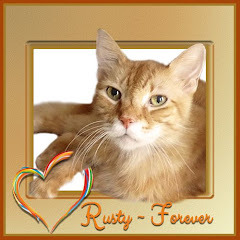 Run Free Our Sweet Lovable Boy! Such a lovely and touching post. 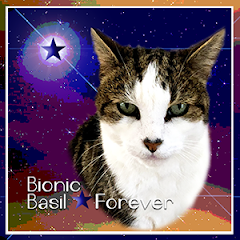 A great tribute to a great cat. We miss you Eric. Our eyes are leaky too. We cried all over again. Your love for the boys both Flynn and Eric is palpable. 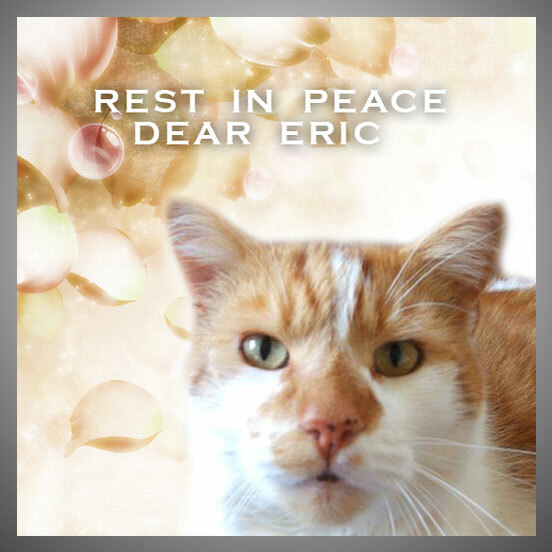 I wept with you as I know the exquisite pain of losing a loving family member such as you did with dear Eric. The pain is unbearable for some time but eventually it softens so that while tears my flow on speaking of him, a smile will tremble there at the corner of your lips as well. And I am convinced that if you have not seen Eric in the corner of your eyes by now, you will. Mark my words. They do that to comfort us and then they go to their place on the Bridge and watch and wait. 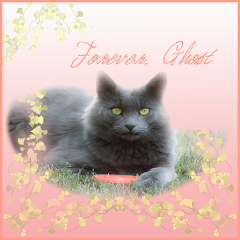 Our hearts hurt so much because Eric has left us. We loved watching him and Flynn together. 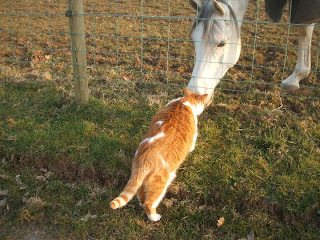 We're sure that Sniffie and Tamir were at the Bridge to greet him. 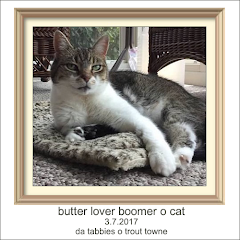 Your memorial post for him is beautiful. 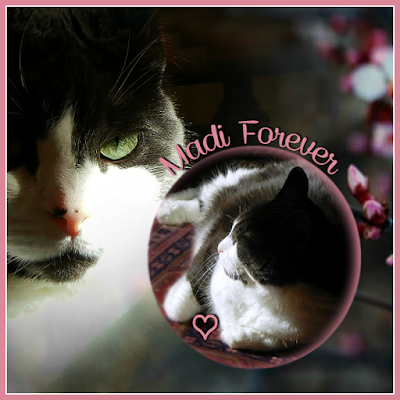 A great tribute to a great ManCat. What a life he had with you. 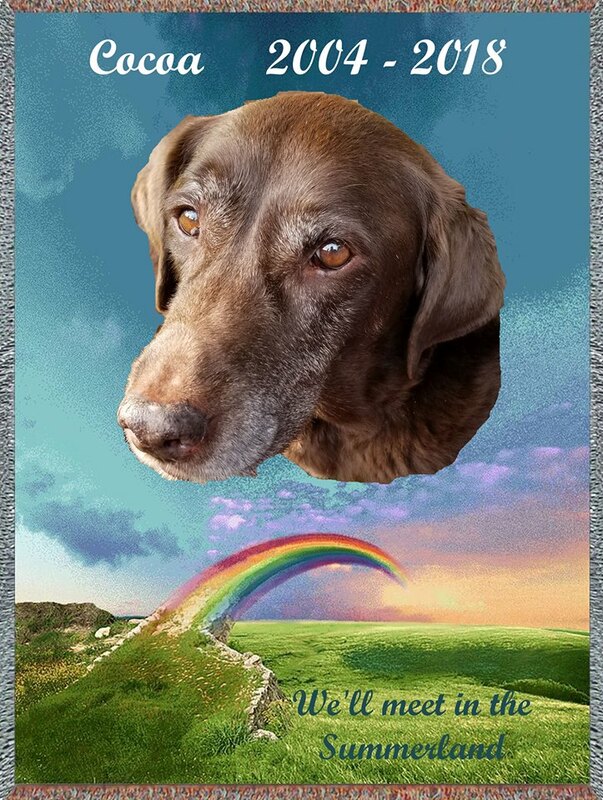 What a lovely tribute to your big handsome boy. He was loved by so many. 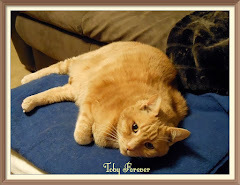 Purrs and hugs to you all. A lovely tribute to Eric. 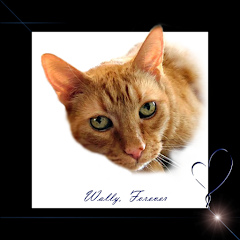 He was such a wonderful cat and we looked forward to checking in on the adventures. Mum got all leaky eyed again. Thinking of Eric, Flynn and their beans. 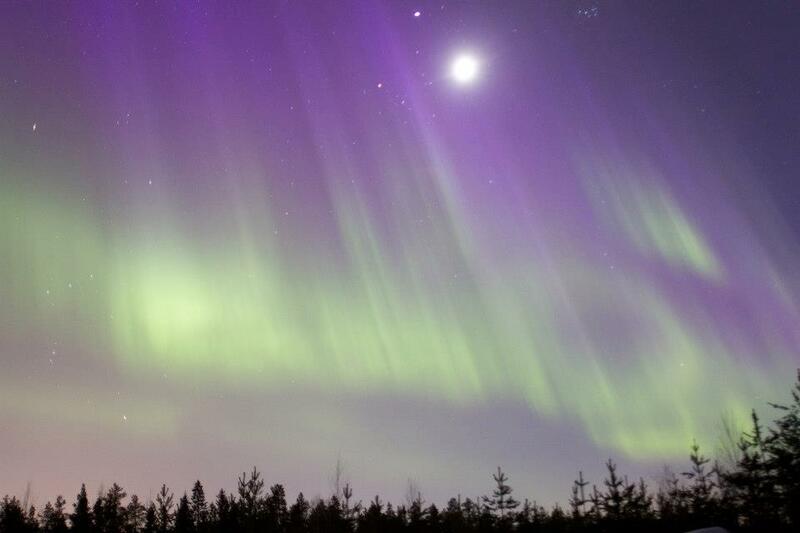 Eric, a shining light, forever in the sky. What a beautiful tribute to Eric. He was a special boy for sure. 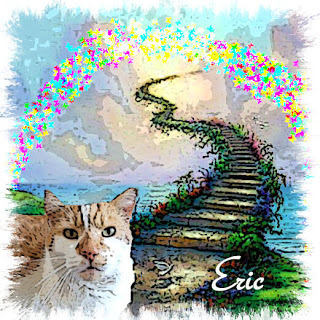 You created a beautiful memorial for your beloved Eric. I am in tears again. I can hardly imagine how you are feeling. You posted some very beautiful pictures of your boy. I especially love the ones of Eric and his Dad, hanging out together. And the special poem and all the creative tributes made especially for Eric just go to show how he was loved by so many. 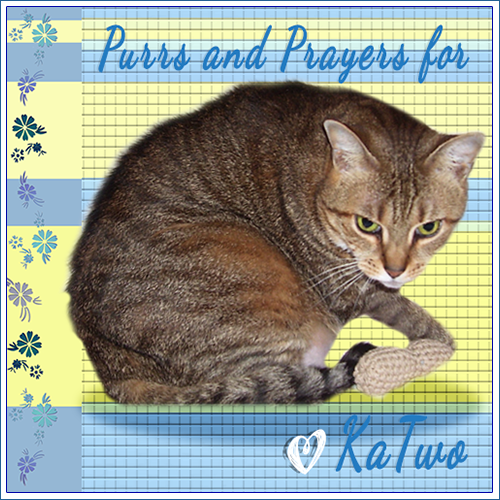 You are in my thoughts and loving prayers at this time. Such a beautiful memorial page for Eric. We'll always remember him. Eric was a Cat amongst Cats. This is a beautiful page which we will visit again and again. Thank you so much for sharing all the photos and memorials: TBT sure knows how to write a tribute. We miss Eric dearly and are very proud to have known him. What a wonderful and loving tribute to Eric - it made me happy and sad at the same time. What a beautiful tribute to Eric. 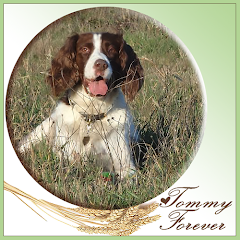 We are so sad that he is not still with you in his fields but we know that he had a good life and was well loved. Please know that you are all in our thoughts. So very beautiful. We are still mourning Eric's loss. One of our favorite "Eric " posts was a video where his dad was patting Eric's hind quarters,. At the end of the video, you could just feel the love between father and cat-son radiating through the screen. This is a beautiful memorial for Eric, capturing him perfectly. 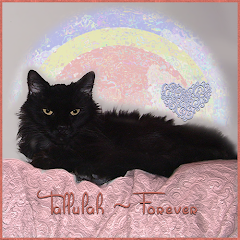 You have shared your loving memories in such a beautiful way. The message you shared is read through tears and helps us all. Love to you and yours. What a beautiful tribute to such a special boy. What wonderful memories you have of Eric. Thank you for sharing them with all of us. Thank you for sharing Eric with all of us. 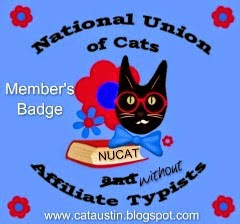 I'm typing this through tears to let you know how honored we are to have known such a fine mancat through your blog posts. 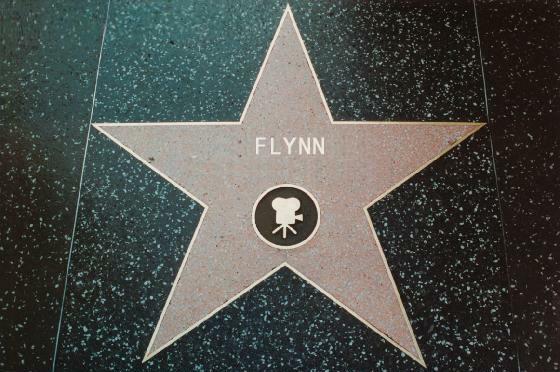 Nobody is ever truly gone when they are remembered, and Eric is remembered by people around the globe who love him, Flynn, and you two behind the keyboard. We promise we won't forget. Many hugs and purrs. 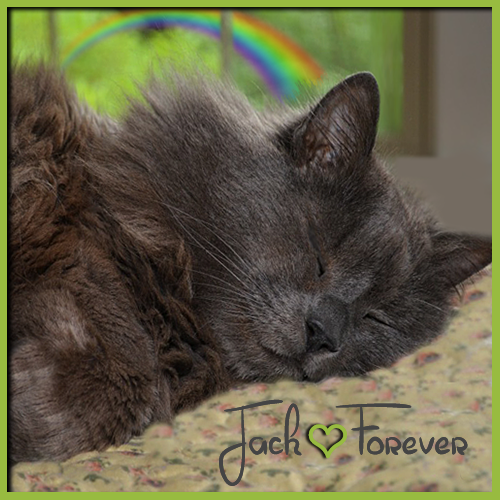 Jackie and Ivor and Flynn, that was the most wonderful tribute we have ever seen. We loved all the pictures of Eric and we know that was hard for you to do but it is so nice to have all those memories. We sure are thinking about all of you. 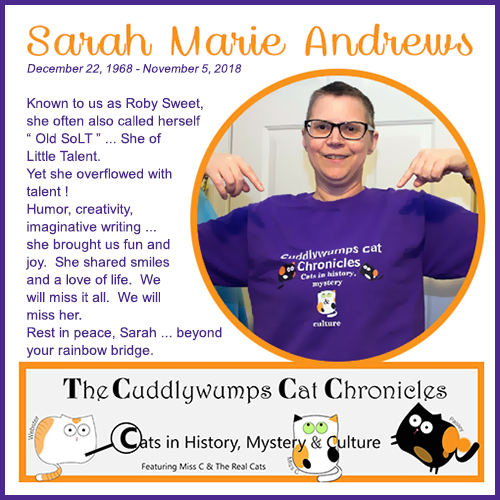 The memorial page is lovely and TBT's comments echo our feelings so well. Thank you for sharing that. 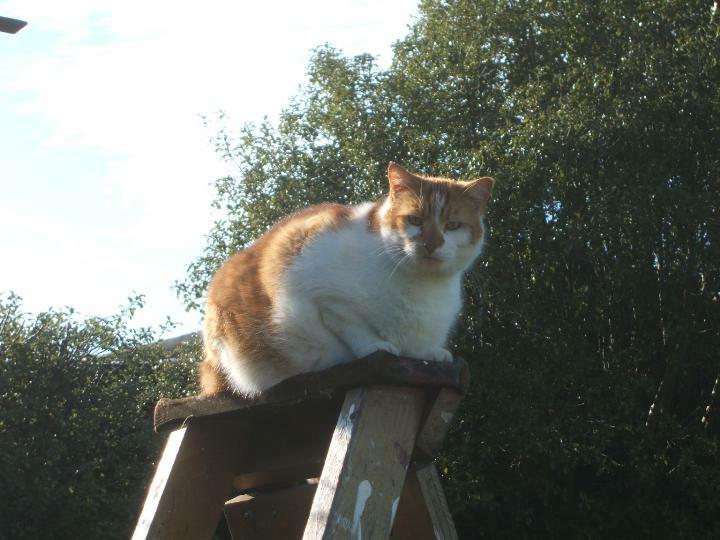 It was so nice to see Eric growing from a kitten into a very handsome well loved mancat and the many adventures he had with Flynn. this was just incredible. 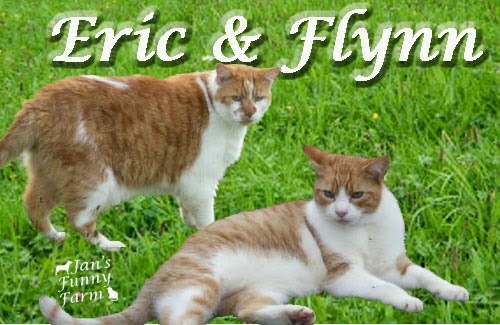 I didn't realize that you had Eric and Flynn since they were 5 and a half weeks old. This just tore me apart but at the same time it was beautiful. Mark's poem and sympathy was heart-wrenching. Oh, yes, tissue needed for this. It's a wonderful, loving tribute to a very special Being, and we remember reading Mark's comment, so poignant. 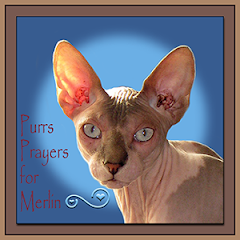 Sending you universal Light and purrs, wishing that time will ease the sharpness of the grief. Time *does* pass hard, not just sometimes, but too often. What a beautiful tribute to Eric. Such a handsome boy. 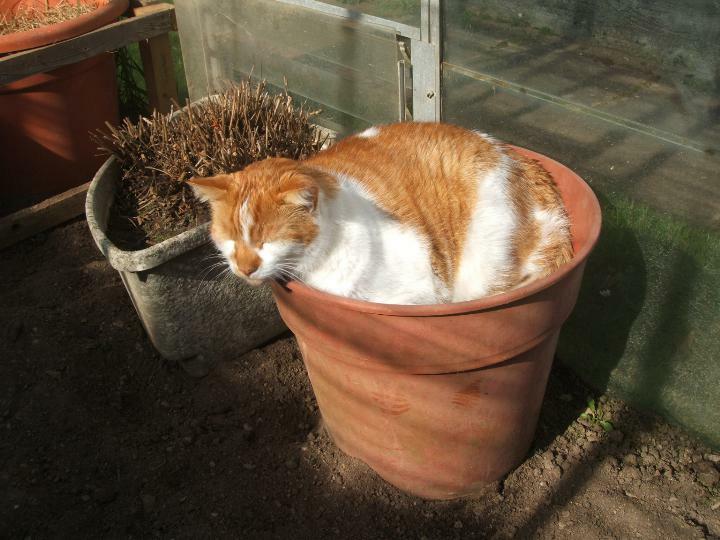 Eric, you were such a mancat! 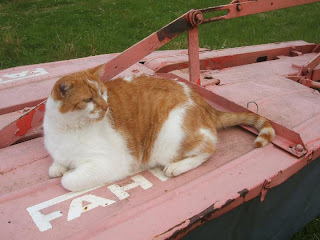 Patrolling the farm and keeping an eye of introoders, and what a way with the farm machinery! 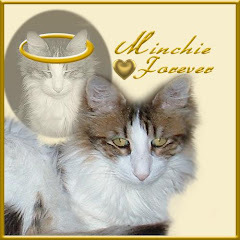 Your mum made an incredible memorial page for you. 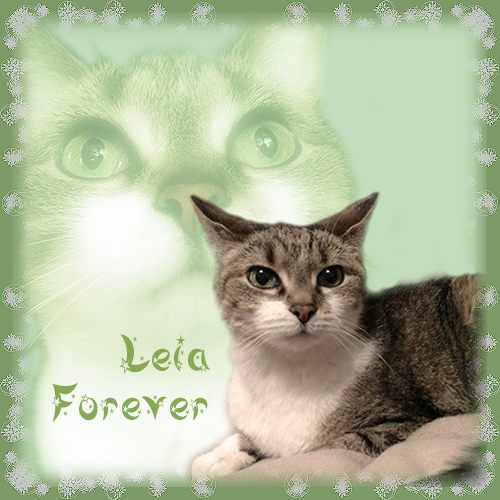 You will not be forgotten, it is clear that you have left big paw prints in the blogging kitty community. And Flynn, keep up the duties you and your brother had! It is now your responsibility to look after the farm and your parents. We know you are up to the task! That was such a moving tribute to Eric and like everyone else have been struggling to read it through the tears. 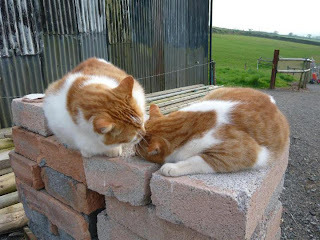 We knew they were both kittens when you were both chosen by them but didn't know they were so young. 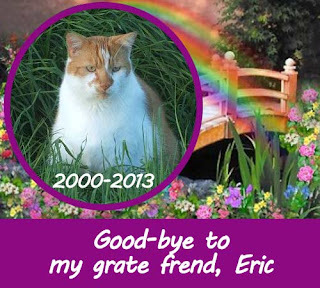 We know Eric brought you so much pleasure in his life and know he will always be remembered by his cat blogging friends. We used to love to see the pictures and read about their walks with you. We are sure Flynn will never forget his big brother and the fun they had together searching for mouses and climbing trees and hope he will still enjoy his walks with you both. 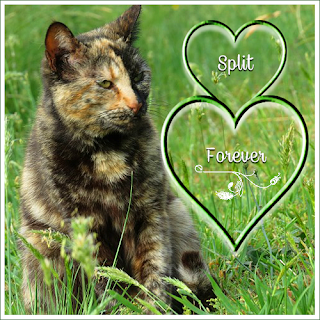 What a lovely tribute to a very special cat. He was a big boy wasn't he! He will live on in all of our hearts. 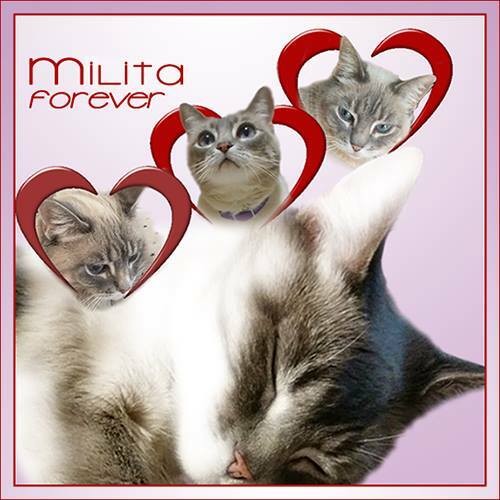 Such a lovely tribute and so beautifully put together, thank you! 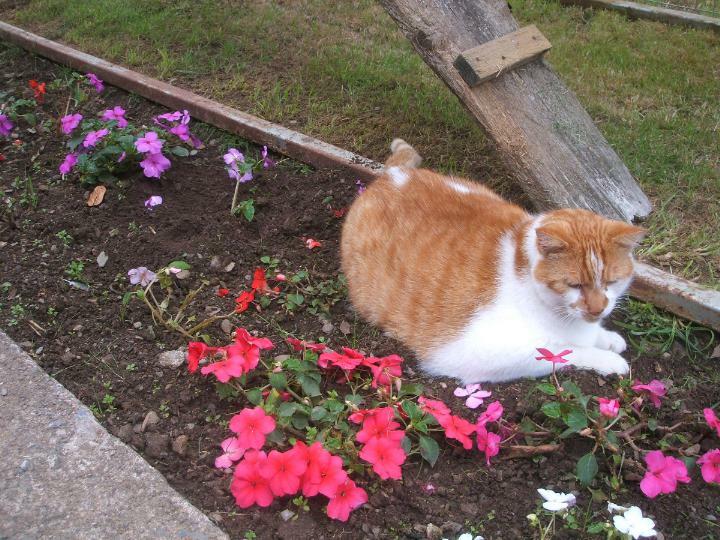 Eric was a fantastic cat and also very lucky to have the best mum and dad! 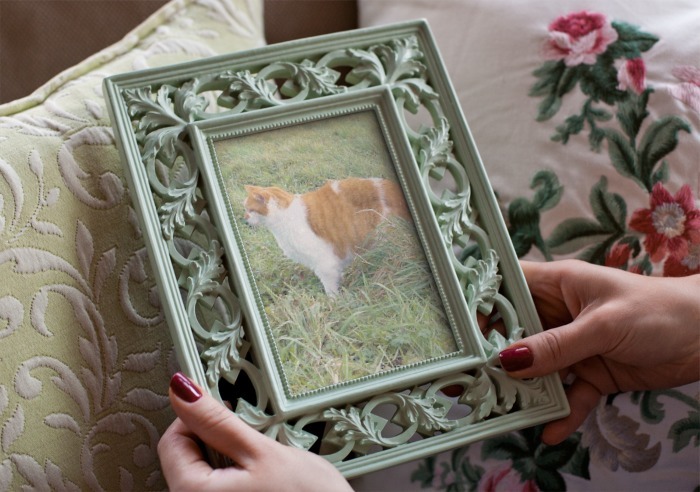 Such beautiful memories of your big-guy. Such a beautiful life he had. 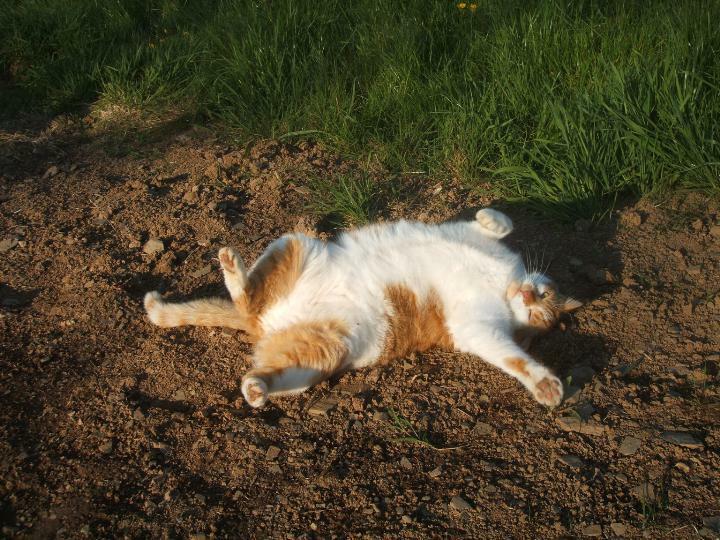 I can't imagine a more wonderful life for a kitty. 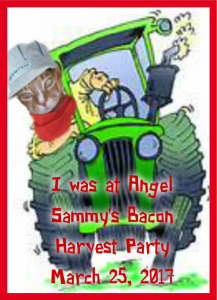 A farm, a brother, a devoted family. You could not have done it better. So many happy memories collected from Eric's life. He was a handsome cat, as is his brother Flynn. Hugs. 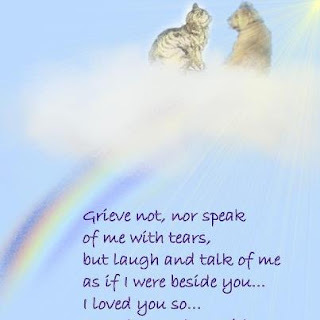 I shed so many tears for the kittehs who have gone to The Rainbow Bridge. 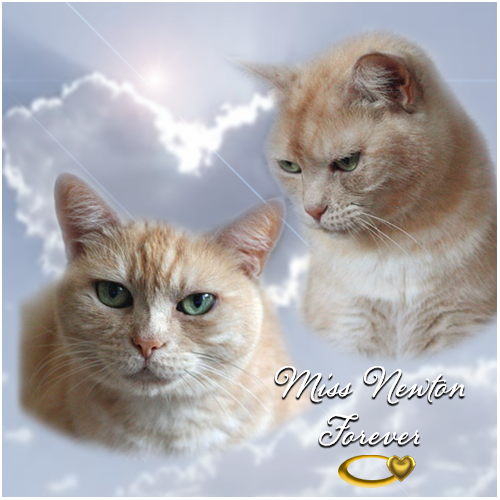 Our only consolation is we know these kittehs had wonderful lives and were loved so much. The tribute is just so lovely for ERic. And TBT is exactly right and said it all so eloquently. We started blogging in 2006, too. Now in 2013, there have been far too many dear friends we've had to wish Godspeed... and it gets harder every time. This is a wonderful memorial for Eric. We miss him SO MUCH! I can't even imagine what you and Ivor and Flynn are feeling. Many hugs to all of you. 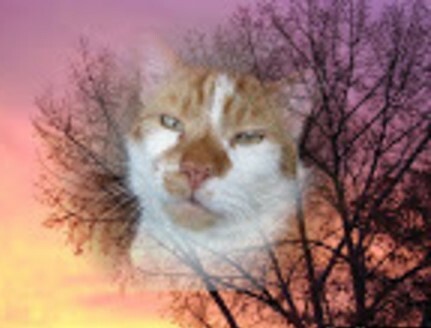 A fitting tribute to a fine man cat. The memorial is lovely. Eric, we will always miss you. Too many furriends have gone. So, so agree with Mark's sentiments. Hope your first birthday at the Bridge is a joyous one. 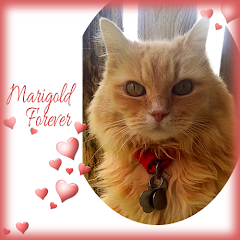 There are so many old furriends there celebrating with you. 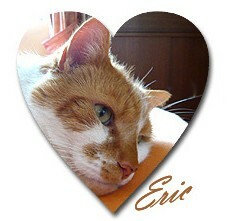 Eric is always in our heart and thoughts!! Always!!!!!! Oh, that made me smile. 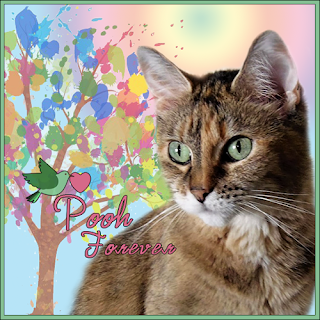 Thank you from all of us for such a beautiful remembrance page. Purrs to you and Ivor and especially Flynn. 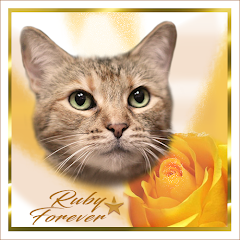 What a fantastic kitty and what a fitting memorial! He had it all with you and Flynn. Beautiful photos and tribute. 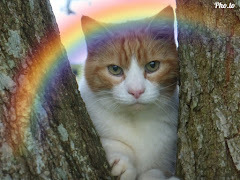 Purrs for all of you. This is a wonderful tribute to Eric. We felt so close to Eric because of his gardening...and how much he and Jonesie would have loved hanging out together. Seeing him again on the farm machinery makes me smile through the tears. 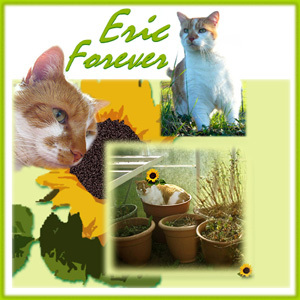 Eric was such a special kitty, this heartfelt tribute shows how much he was loved. This is an absolutely beautiful tribute. Mom has tears in her eyes again. Hers always cries for our friends who go to the Bridge. Eric will never be forgotten by us. We felt like we knew him, even though we never got to meet him in person. We loved Eric and valued his friendship. This memorial to Eric shows how deeply he was loved. It is those very special friends we have that give our lives meaning. Thank you so much for sharing all of his wonderful stories and photos. May we all meet again over the Bridge and laugh about our times here. 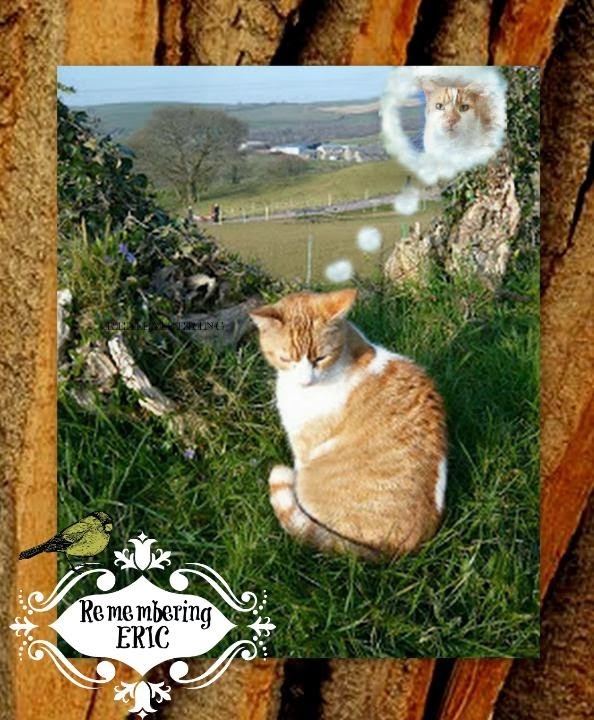 What a beautiful and lovely tribute to your beloved Eric. It is so clear how much you loved him, and how much he loved you all. Thank you for sharing him with us. We will love him always, and never forget him. This is a beautiful tribute to a wonderful brother, friend and all around good guy. You surely did him proud with this post. I know it must have been very hard. Madi and I thank you for sharing your two handsome boys with us over the last 4 years... I remember a lot of the pictures on this post. I always thought the one of him on the counter (where he wasn't suppose to be) by the red flower was especially handsome. Eric seems to be saying 'yes I know, I'm on the counter but look how handsome I am'!! We meant to get by sooner to read this tribute but our world went upside down on Monday. Hands across the waters from hearts that really care. We just found this page. 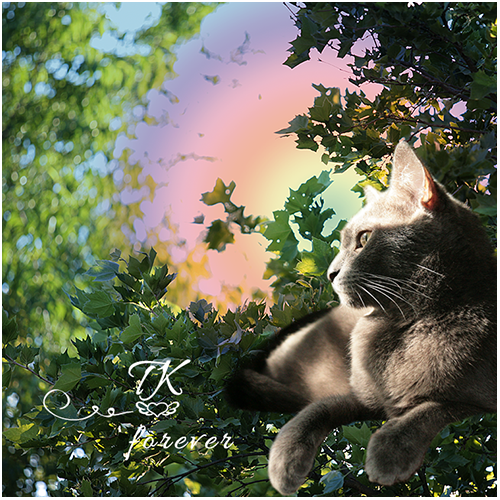 It is really beautiful and such a wonderful testimony to the best kittyboy ever. Rest in Peace Eric. You are in safe hands now. We will always miss you. Wonderful tribute to Eric - thanks for sharing him with all of us, and we will look forward to his flashbacks. 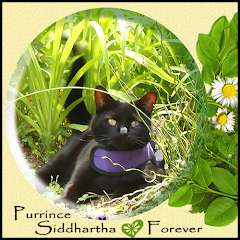 Beautiful, beautiful post and tribute for your very special boy. 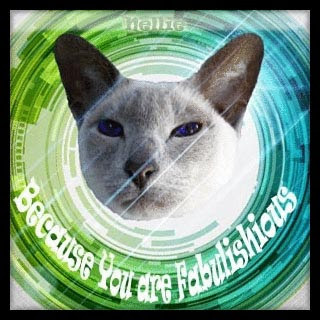 Purrs to you all. That is such a wonderful and moving tribute to Eric. We can feel how strong the connection between him and you was and always will be. This is such a beautiful tribute to Eric. It is so sad that beautiful cats like him and my Fat Eric have to go to the Bridge. 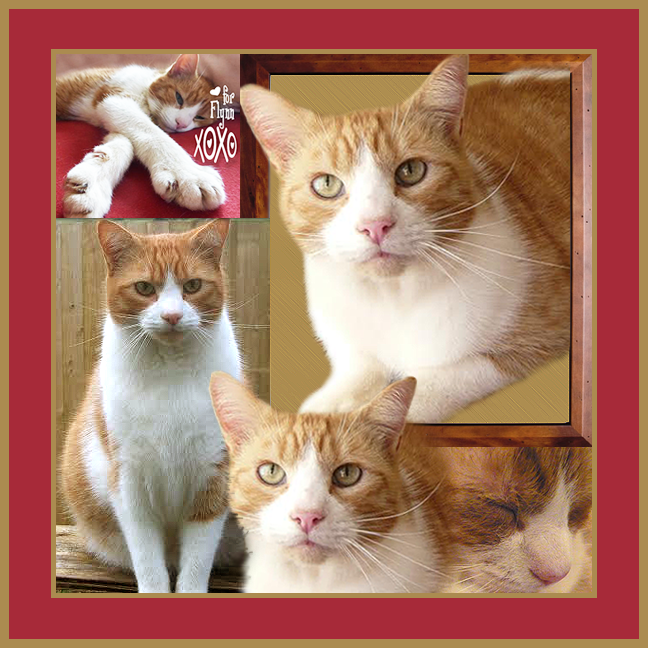 I am tearing up reading this and thinking about my own ginger boy again. Many hugs for you and Flynn. 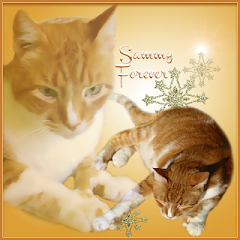 Such a wonderful tribute to your special ginger boy. 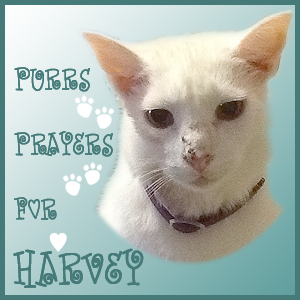 Thank you for loving him so much and giving a purrfect life whilst he here on earth. 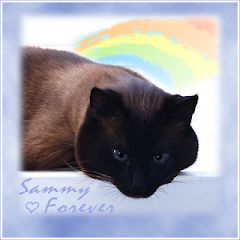 We know how much you must miss him and grieve his loss and hope you are comforted by knowing you gave him the best life ever. Love to you all ~ and especially little Flynn who must miss his brother so very much. I was just thinking about your big boy Eric and how much I loved him and Flynn. I loved seeing their adventures in your lovely English countryside. You started blogging just before I did with Jake and Bathsheba and I looked forward to your daily posts. Two beautiful big gingers. When my beloved J&B died, I picked out my own beautiful ginger, Mr. Emerson, and I was so proud to pass along a cat camera to you from Mr. E. Alas, he lived only a scant three years, but I loved him dearly. 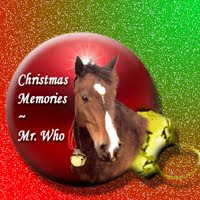 Revisiting your blog brings back many happy memories, but sad ones as well. We all have lost so many of our dear furry friends. Their lives are all too short, but they make such a world of difference in ours. Missing Eric and sending you heartfelt condolences. I am so sorry for your family's loss of Eric. 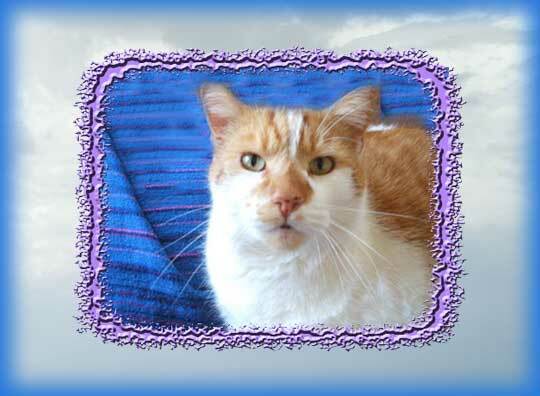 Eric was such a wonderful and sweet boy :-) I know all of you must miss him so much. This is so beautiful. 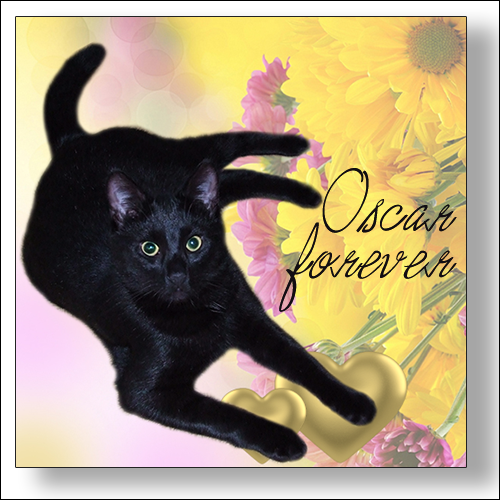 We purred and cried for Eric when we saw the email from Ms. Ann at Zoolatry. Eric always made us smile...Then and now. 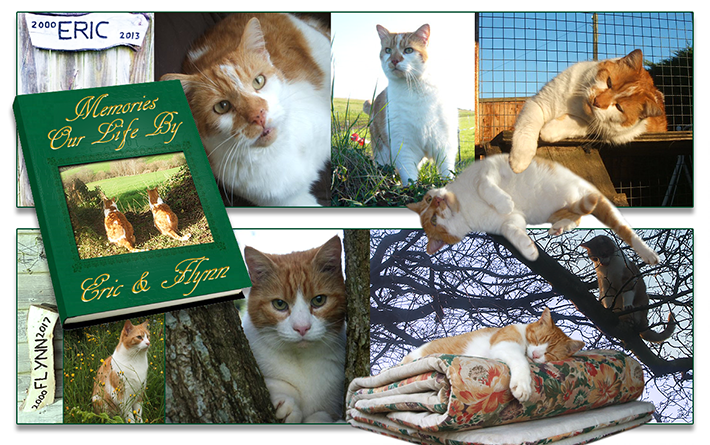 We wish you happy memories and a continued peace, with extra hugs to sweet Flynn. 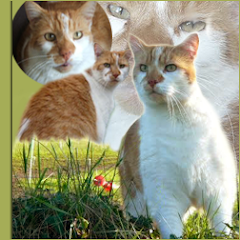 We did know of Eric passing until we blog walking to Adan & Lego page. Be strong Flynn and his parent. What a wonderful tribute to your beautiful boy!!! 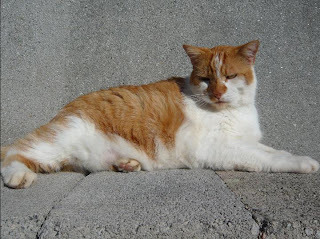 We all loved Eric and miss him very much. so sorry.. it's the first time i visit the blog... Eric it's so beautiful! What a beautiful tribute to Eric. 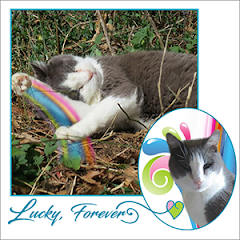 How lucky was he to have you as his family, a home with his sibling and lots of adventure! Peace.